Cora Weiss (second from left), Executive Director of the African American Students Foundation, at Idlewild Airport welcoming the 81 students from Kenya on the first Airlift. 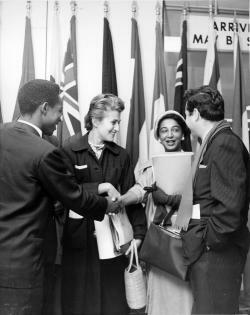 Prior to the airlift, Kenyan labor leader Tom Mboya had toured the United States and persuaded many universities and colleges to provide scholarships for students from East Africa, mostly Kenya. The African American Students Foundation was founded to raise money to get the students to the United States to use these scholarships. The Foundation organized several airlifts. On the right with his back to the camera is William X. Scheinman who set up the African American Students Foundation. Scheinman was also a contributor.